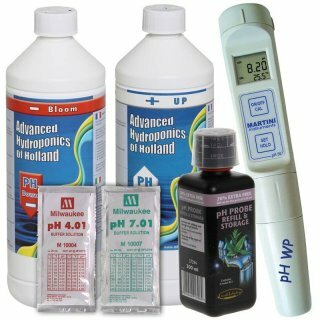 With this complete set it becomes easy to have the pH value of a nutrient solution under control. Just calibrate the Milwaukee stick with the enclosed calibration solution and then adjust the pH value of the nutrient solution with the aid of pH- and pH +. 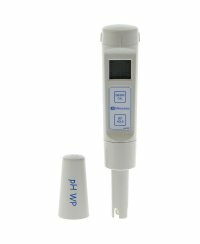 If the stick is not in use, always put pour a little bit of the storing-solution in the cap of the pH-stick to prevent the electrode from drying-out. The waterproof and floatable Martini pH55 measurement device by Milwaukee has a big, dual LCD display that shows simultaneously the pH value in the (extended) range of 2,0 to 16,0 pH and the temperature from -5,0 to 60,0 °C. In addition the display shows graphic symbols to simplify the handling. The pH55 temperature sensor enables a fast reaction time, because, due to its close position to the pH electrode, exact measurements are guaranteed. The pH and temperature electrode can be exchanged fast and easily. It only takes to unscrew the plastic ring on the electrode and replace it with it with a new one. 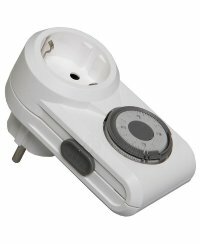 The pH55 features different functions, for example a stability indicator (of the measurement) and a ?hold-function? to freeze the current measurement, an automatic temperature compensation, an automatic shut-off function after 8 minutes of nonuse, as well as an exchangeable Mi56P replacement electrode. 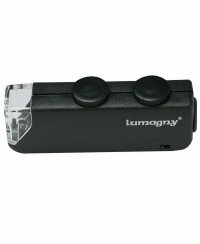 - Measurement range temperature: -5,0 to 60°C / 23,0 to 140,0°F. 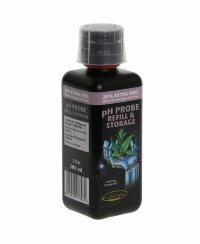 Advanced Hydroponics pH- Bloom is a pH regulator to reduce the pH value in the nutrient solution during the blooming period. pH ? 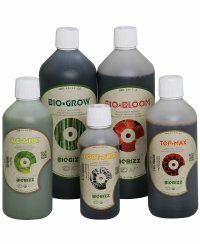 Bloom (pH- Down Bloom) acidify the pH value with 59% phosphoric acid. A correct pH value is absolutely necessary, so that the plant is able to optimally absorb all nutrients. Meanwhile the pH regulators by Advanced Hypodroponics belong to the most favored on the market. 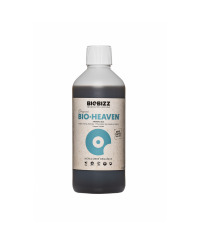 With their aid it is possible to adjust and hold the pH value to the values needed at the different phases of life of the plant. The pH regulators just have to be added to the watering to reach the desired pH value. 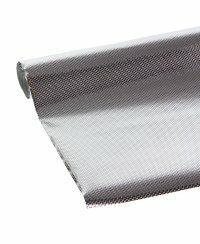 Suitable for all watering methods and substrates. 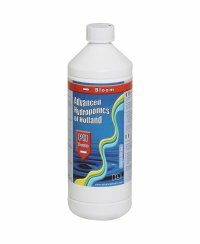 Advanced Hydroponics pH+ Up is a pH regulator to boost the pH value in the nutrient solution. During the increase of the pH value it is not necessary to consider the development phase of the plant. 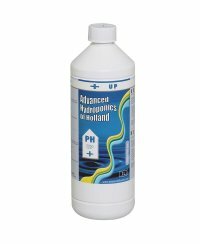 Advanced Hydroponics pH+ boosts the pH value in the nutrient solution with 28% caustic potash.